I ended up getting the Hammer and completing Level 4 as well as doing majority of Level 3, but I cannot find the Ladder which I believe is in Level 3. The ladder was accidentally inaccessible in the initial release. The hotfix update posted yesterday resolves this by closing a gap of water in one of Level 3's southwest rooms with another row of docks, so you'll have to overwrite your current .qst file with the new download from the quest page, then continue your game using that file. I swore I downloaded the latest update for the quest but I guess I was wrong, and even backtracked to previous dungeons to see if it was there. Yeah I think that was the only fix in the update. Very minor, but very important. I made it through the rest and it seems to play fine, so you should be good to continue once you can pass that room. The blue ring can be bought right before Level 4. Just follow the path upwards past the level. Probably should mention that Whistle Whirlwinds are a thing. 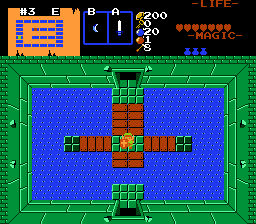 Magic Sword is located near Grey-colored mountains on a screen with 7 graves on it. a Hint for the sword's location from the quest: "Seven graves nearby, a reformed wall they imply." The wallet is found in the cave to the south of where the flippers are found. 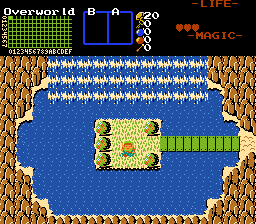 Very north in the overworld. Sorry, where is the bow? I played using Zc 2,57 and found it. Due to problems I reinstalled ZC 2,.53 and starded again the quest, but now I don't remember where is the bow..
Quest is built for and meant to be played in 2.50.2. Bow is in Level 3 in an item cellar found via a push block. 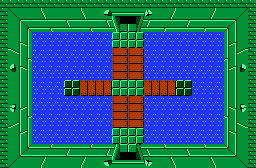 The arrow is on a screen where 10 arrows are revealed next to a block. Edited by patgarret, 14 February 2019 - 10:57 AM. Edited by soxfan2k4, 15 February 2019 - 05:06 PM. 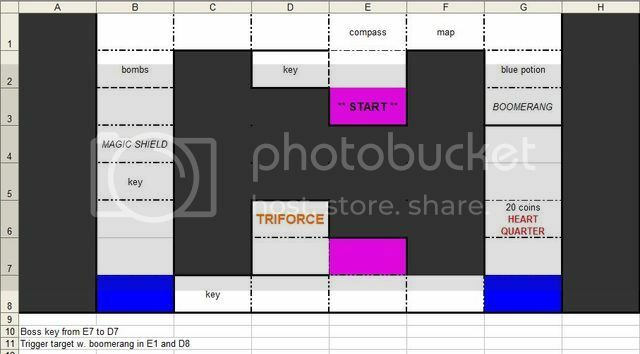 Key on B7. Odd Blocks...? Candle is to the east of the stairs leading up to Level 1. Need the boomerang to get it. Did I not download the patched version?